We know how important it is to have the correct water temperature whenever you take a bath or shower. It is also true when you wash your hair, dishes or clothes that you have the right water temperature. If the water is overly hot, you could scald your body while showering. Plus, you could burn your hands when washing your hair or the dishes. If you are experiencing water temperature problems, we advise you to call our reputable plumbing company right away. Our highly trained technicians will inspect your plumbing to determine if a water heater replacement in Phoenix, AZ is necessary. We have been in business for years and offer first-rate plumbing services that will not be matched or surpassed. If it is determined that your water cannot be fixed, we guarantee that our first-rate water heater replacement services will not be beat. 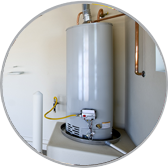 We assure you that your new water heater will be professionally installed by our skilled technicians. You can be assured that we will provide you with a high quality and modern water heater that will function properly for many years. Our skilled crew members are well trained and can be trusted to do an efficient job installing your new water heater. If you hire us, we assure you that our top-rate services will not be duplicated, which is why we strongly urge you to give us a call. Over time, water heaters will fail to work as they should and will most likely need replacing. If you notice that your water heater has malfunctioned, we guarantee that our first-rate and reliable water heater replacement in Phoenix, AZ services will not be equaled by any competing plumbing company in the region. Our expert technicians are very reliable and will do the job right the first time. Contact us today to make an appointment.